I made this pillow with my mom over the weekend. I haven’t sewn in years. She taught how to add the piping to the edge too. The pillow looks a bit lumpy because I think the cushion is a little to big. I have to keep practicing. I’m excited to make some new Spring pillows for our sofa and bed. Great job! I haven't sewn in years either but I got a sewing machine like a month ago…however-it's still in the box! I need some motivation to tackle my first project and seeing this is inspiring! Well done, all you need is a bigger inner. General rule of thumb make your cover 2" smaller than your inner; e.g 18" cushion, 20" inner. Good luck with your sewing projects; I haven't sewed for many years I'm sure I'd be completely rubbish now! 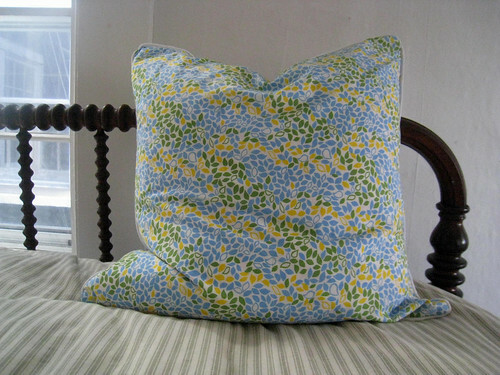 Once i master pillow making with piping I will share a how to. Deal, Tracy? I knew someone was going to ask where the fabric was from, shoot. I remember getting it at Purl Soho a few years ago. The name was not on the small piece I had. Sorry guys. I have a whole box of fabric I have collected over the years. I love the fabric! And I've yet to try adding piping to the edge of one of my pillows, so I'm very impressed. Moms are the best teachers. I would love to know where the fabric is from as well, so cute! Love the fabric!! Where is it from? Great job. love it….love the pretty springy fabric! What great fabric. What a creative artist you are. Love the fabric! Great spring colors.